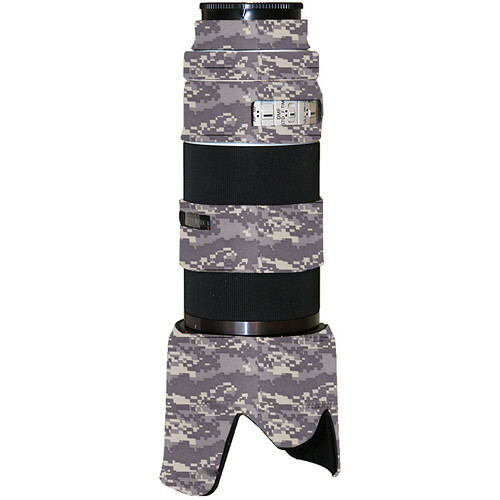 The digital camo LensCoat for the Sony 70-200mm f/2.8 Lens from LensCoat is designed to provide maximum protection for your lens when shooting outside. It covers the lens with a 100% closed-cell neoprene coat that protects the lens from bumps and scratches. It's ideal for nature and outdoor photographers, as well as sports shooters and photojournalists. It also provides a thermal barrier, protecting your hands from the cold in lower temperatures. The cover is waterproof, providing protection in inclement weather. In addition, the added protection will help maintain the resale value of the lens. This version comes in a digital camo finish to better blend in where desirable. Or, it can be used just for its protection value. Box Dimensions (LxWxH) 8.5 x 5.7 x 0.8"
Lens Cover for the Sony 70-200mm f/2.8 Lens (Digital Camo) is rated 5.0 out of 5 by 2. Rated 5 out of 5 by Fukumae from Perfect Fit I purchased this for my 70-200mm f2.8 for a football game that I had field access and for which I was not sure what the weather was going to be during the game. I wanted some general protection and this was it. It comes in 3 small sections that you slide over your lens & lens hood. They all fit very snug and there was no worry that it would move or fall off at any time. As it turned out, the game night weather was clear, but very cold. I had this lens on a 2nd body with a Black Rapid strap. It was great to pull up the 2nd camera/lens and not feel the cold metal of the 70-200mm barrell. The cover does not impact your access to the focus or zoom ring. I am not sure how the cover would do in more severe weather but I like that it does give basic protection from keeping it on sling hanging from my side. Rated 5 out of 5 by UJNERJOHN from perfect look& feels good... This cover perfectly fit my sony 70-200mm 2.8 g lens.I think it will prevent the lens from scratches ,dent etc to the outer painted surfaces.The zoom & focus ring are not covered. Does this fit a sony alpha a58??? This is a lens cover, and does not fit cameras themselves.